Torontonians are not expected to see big tax hikes in 2017 as the city tries to close its $91-million budget gap, while grappling with $33 billion in unfunded capital projects. Toronto City Manager Peter Wallace presented the preliminary operating and capital budgets today at a City Hall committee meeting. The proposed 2017 budget includes a two-per-cent increase in property tax and a 10-cent hike for TTC fares. The city is on the lookout for alternate forms of revenue with Mayor John Tory proposing a road toll for the Gardiner Expressway and Don Valley Parkway – a move that could bring in more than $200 million annually, but may not be fully implemented until 2024. There are also some short-term revenue recommendations in the proposed budget including reinstating the personal vehicle tax and introducing a hotel tax. 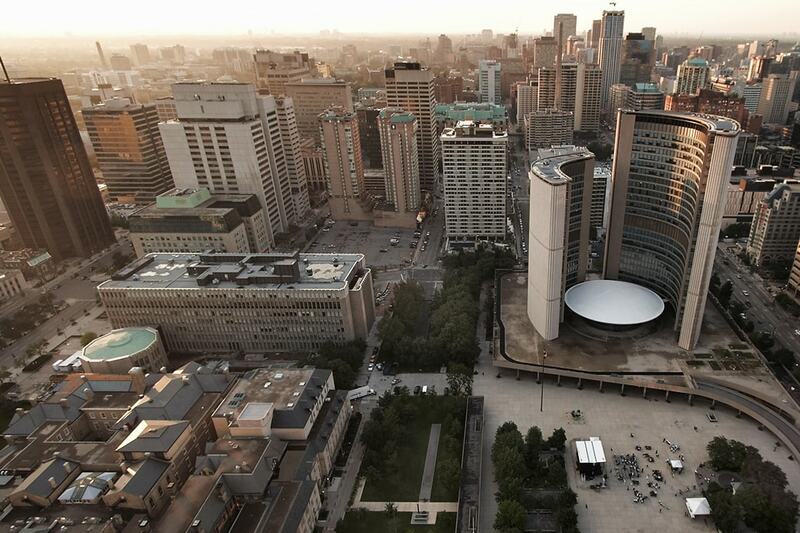 As City Council begins debating the proposed budget, U of T News spoke with city experts Matti Siemiatycki and Enid Slack about how Toronto should handle its financial and operational woes. What do you make of the 2017 preliminary budget? I think this is the same problem we see every year at budget time in the city of Toronto. We come to the point where there is a gap – this year it's $91 million. I think it's telling us we have a bit of a structural problem here. We seem to have this problem with the gap, and in the short run, there's only two ways to deal with it. If our expenditures are greater than our revenue, we either have to cut back our expenditures or we have to increase our revenues, and so that's what this budget is trying to do. It's trying to cut expenditures and find some way to increase revenues. In the work we did more recently, we talked about how over the long term we have to think about whether the property tax and the land transfer tax are sufficient to meet the growing expenditure needs of a large city like Toronto, and we concluded that they aren't enough. In Toronto and other major cities in Canada, we need to look at other sources of tax revenue. Is this budget addressing both the short-term and long-term revenue needs for the city? This budget is I think focusing more on the short-term fix in the context of understanding that in the long term we have to do something bigger. Some of the recommendations on municipal land transfer tax or personal vehicle tax may be short-term solutions. I think it really does both. The biggest problem here is that the major source of revenue for cities in Canada like Toronto is the property tax, and the city has made a commitment to only raise property tax by the rate of inflation or less than the rate of inflation. I think, while I understand the politics behind doing that, it does put the city in a bind in terms of trying to balance its budget. Why the resistance to increase property taxes? The property tax is a very visible tax. If you look at other taxes, like the income tax or sales taxes, they're much less visible. Most people who are on salary, for example, don't know what they paid in income taxes last year. When it comes to sales taxes, we know we pay 13 per cent, but nobody knows at the end of the year, how much they put out in sales taxes. But people do know what their property taxes are – this is money they have to pay maybe twice or six or twelve times a year. It's very visible. That's very good from an accountability point of view – people know what they're paying to their local governments, and they know what services they're getting. But that visibility makes it very hard to increase those taxes. Is tolling the right way to go? We had a lot of conversations over the last number of years about what to build, where to build and how to build it. The part that's always been missing is how we're going to pay for all of this investment and all of this infrastructure. I think the conversation about tolls is really the next phase, which is the hard part of the conversation. You've heard all sorts of responses to this – one of which is that it's not enough, and it's too far down the road. If we're really looking at 2024, that's a lot of years between now and then that have to be bridged. If you look at how much money they raise, which is somewhere in the $200-million- to $250-million-a-year range, that's a starting point but the gap on the operating side annually is far larger than that, and the gap on the capital side is extremely large. What I would ask people is, if you don't like this tool, if you don't like tolls, how else are we going to raise the big dollars to pay for the infrastructure that I think there's a consensus that we need? There are a fairly small handful of taxes and revenue tools that will generate large amounts of money and for various reasons a lot of those are also unpalatable for people. If it's not tolls, then what are the other options? It's a fairly short list. One option is a fairly significant property tax increase, another option is a city-wide sales tax, which the city doesn't have the capacity to levy themselves – they'd have to get provincial permission, another is a commercial parking levy and a local income tax. Fixing the Gardiner Expressway is now estimated to cost $1 billion more than expected – is this another hiccup for Toronto infrastructure spending? That's been one of the frustrations – the budgeting and delivery has been challenging for a lot of big projects. That’s really part of what we need to address in this region and in Canada more broadly. We have an issue with how we pay for infrastructure, that's true, but we also have an issue with how we deliver the projects once we select them and once we actually decide to proceed. That's proving to be frustrating for people and it's sapping public confidence and trust that government, if we decide to give them more money, can actually deliver on these projects efficiently and in a cost-effective manner. In terms of transportation, what would you like to see Toronto focus on in 2017? You really have two things going on at the same time – one is the long-range planning and the big visionary projects – the subways, the light rail lines, the bus rapid transit project, the really definitive city building initiatives. There's a big planning push that's going to happen, but we also have the day-to-day operations of our system – we have, on the one hand, discussions of mega-projects that are costing billions and on the other hand, we have the TTC and other city agencies under a request of a 2.6-per-cent budget cut. What I want to see is at the same time that we're planning the mega-projects, we're also figuring out how to put the operations of the service that people use on a solid footing and to make sure those budgets are in place. One step in the right direction is the low-income transit pass, which the executive committee last week looked at and approved. That, to me, is a really important step. Transit is a key barrier for people with low incomes – a barrier to jobs, a barrier to health care, a barrier to being a part of the city. I think that bringing in a pass is really an important step for the city to ensure that accessibility is available to those who are really in need.